Okay! Okay! Here I am finally! So, it's been a while since I have actually blogged...I have been reading everyone's blogs and thinking to myself, "Self, you should really get to blogging as you have a lot to say!" Now that it comes down to it, geez, am I shy? Why is nothing coming to mind? Hmmmmmmmmph. Well, I guess one reason I was a bit MIA was because of politics. Yeah, my ticket didn't win and I am quite sad and, quite frankly, concerned for my country. We'll see what happens though as I am trying to be positive. Exciting things happened during the campaign season though that I must share with you. I saw both Sarah Palin and John McCain in Scranton! I went to Governor Palin's rally by myself so I was able to get there early and early I got there and I was in the second row pretty much right in front of her podium. After the rally was over, I got to shake her hand and tell her that she was the person that got me on board with her running mate. I also got to meet her husband, Todd, and told him that I only wished his family well and God bless them. For the country music lovers out there, I also met Lee Greenwood! What a nice guy he was, too. It was a great time for me. Rich and I went to a John McCain rally the weekend before the election and, being I wasn't by myself and Rich has bad legs and his bad back, we sat behind the stage, but we were there! That was the most important thing! It was fun, fun, fun. Let's see....what else? Well, Weight Watchers is going pretty well. I am holding steady at 35 pounds lost and am ready to break through this plateau. I am bored with it already so I am going to step up my exercising and get back to writing everything down. Well, being it's not 1980 anymore, I will just make sure that I key everything I eat into my eTools. I bought my Blackberry so that I would have my WW tools available at all times, but I got extremely lazy. I mean, I weigh and measure EVERYTHING, but I got lazy with keeping my points under control. I am still WiiFitting so that's probably keeping me status quo. Today was my 183rd day of WiiFitting with only a few days missed here and there and those missed days were mainly because we were away. I bought a new laptop last month. I was sick and tired of using Rich's Second-Hand Rose computer so I started shopping online. Just for $hits and giggles, I checked QVC one day and wouldn't you know it? The Dell I was looking at was the TSV so I scooped it up in pink! It was between pink and green, but pink always trumps green as we all know. Stitching is going....well....yeah, it's going. I am currently working on Little House Needlework's Brave Heart. I am using a piece of 28 count evenweave and Crescent Colors floss. Can I tell you something? Don't tell Sharon Crescent, but I'm not a big fan. That floss knots up on me like no other floss does. It's so annoying. With every stitch, I realize that I am a DMC girl....do a row to the right and come back and cross them all. I hate stitching one stitch at a time. Sometimes I forget that I have to do one at a time and I go to the right (always to the right!) about 10 stitches and then have to frog and stitch them one at a time. Blah. One would think I'd have a WIP pic to show off, but I don't. Take note of my online kettle for Salvation Army on the top right of my blog. Feel free to make a contribution...every dollar helps! It goes directly to them as I am simply hosting the kettle. I am going to match whatever donations are donated so donate often and early if you care to. I think that's all I've got for now. Next time I will post a WIP pic, I promise. I actually took one with my phone and emailed it to myself, but it didn't arrive yet so it will have to wait until next time. I have learned a bit about what it takes to have a fun blog from reading my friends' blogs so I am going to try to make a fun blog and update it on a more regular basis! Now I'm going to go down and stitch. Thanks, Debbie from My Big Toe Designs! This design by My Big Toe Designs is actually called "Miracles Happen" and, when I saw it, I knew I had to stitch it. I also knew that it wasn't going to be a miracle that was going to get me back in my skinny jeans, but a lot of hard work. I had it in my mind that I was going to keep my skinny jeans that I could no longer fit into and go back to Weight Watchers so that I could wear them again. I went back to WW and also was fortunate to be able to buy Wii Fit and, through a combination of really working hard with both tools, I have lost 27 pounds. 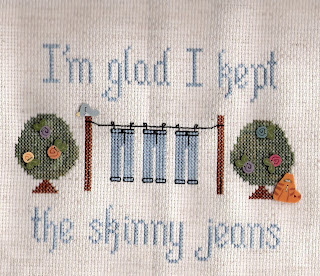 When I hit 25 pounds gone, I decided that I was going to start stitching this design, but I needed it changed as no miracles -- as I originally thought -- made me get back into my skinny jeans so I emailed Debbie and asked her if she could or if she would mind if I recharted it proclaiming my being happy that I believed in myself and kept my skinny jeans! Debbie was kind enough to chart it up for me and I am just thrilled with it. It was my 25-pound award to myself and I love it. Debbie, you are absolutely the best and I will always remember your kindness in doing me this favor even when you were so busy. I am your newest biggest fan! So, I have decided that I am going to start stitching! No, really. I have all this stash that I bought because I wanted to stitch it and that's what I'm going to do! I started and finished this today as it was a really, really quick stitch! I have a few more of these little Shepherd Bush designs so I'm going to look for them soon. Another QSW Plus Three Day Finish! Well, I tried to make this a QSW piece, but it seems I just can't sit and stitch for hours on end so things take me longer. While stitching this piece, I had our Angie on my mind. I can't believe it's almost eight months since we lost her. 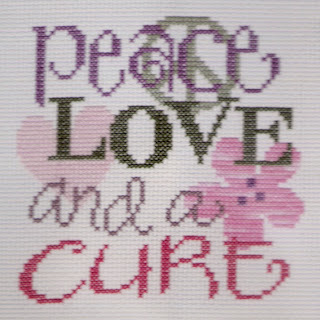 Now I don't know what I am going to stitch next, but it's going to be another quick one, I think. I am thinking of "Oh Say" by Shepherd's Bush, but we'll see. Well, this CSF QSW took two QSWs plus three days! Eeeeeek! I did enjoy it though. Am I turning into a linen snob? I might be! Eeeeeeeek again! Next up is "Ewe Alone" by Sheepish Designs. Actually, I am going to put a few stitches in right now. 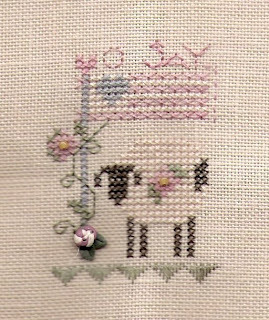 Some days I get to thinking about Angie and I read her blog....it makes me feel like a better person to have known her and I just like to look at her stitching and see the comments that her stitchy friends left her to know and remember how much she was loved. I hope her family is doing okay....she loved her family so much and they loved her back so unconditionally. I just didn't want anyone to forget her as time is flying by so fast so I figured I would share her blog once again. Today I miss her a lot.